Nottinghamshire fast bowler Harry Gurney says travelling with the England squad over the winter has given him an appetite for international cricket. The 27-year-old spent time with the England team in Australia for pre-Ashes series net practice. "The month I spent in Australia was a real learning curve, I took a lot away from it," he told BBC Radio Nottingham. 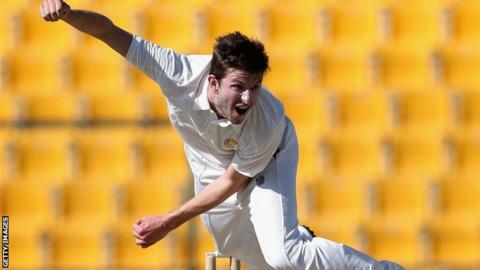 Gurney subsequently received his first call-up for the one-day tour of the West Indies earlier this month. And although he did not feature in any of the games in the Caribbean, he believes the experience has developed him into a better player. England have not had a left-arm pace bowler appearing regularly in the side since former Notts paceman Ryan Sidebottom, now with Yorkshire, played his final game in 2010. And Gurney would provide welcome variety if he could improve on the form that brought him 70 wickets in all competitions for his county last summer and force his way into the selectors' thinking. "To get called up to the full squad was an amazing feeling despite not playing. I feel like I've come back a better player and hopefully I can show that," he said. "I loved every second I was there, and I'll be doing everything I can to perform for Nottinghamshire. If that leads to more involvement in the England set-up that would be great." Meanwhile, after batsman David Hussey ended his decade-long affiliation with Notts at the end of the 2013 season, the county have signed Australia fast bowler Peter Siddle as their overseas player for the summer. His arrival at Trent Bridge will bolster an already experienced seam-bowling attack, which also includes England's Stuart Broad, Andre Adams, Luke Fletcher and Ajmal Shahzad. The signing will create competition for places, a prospect Gurney relishes. "To play alongside the likes of Peter Siddle is brilliant and we're excited as a bowling unit," he added. "In a squad when you are a shoo-in week in, week out, particularly as a young bowler coming through, you are less likely to go that extra yard. "With this competition for places in the squad, you look around the changing room and you know you've got to be right at the top of your game if you're going to have a sniff of playing."